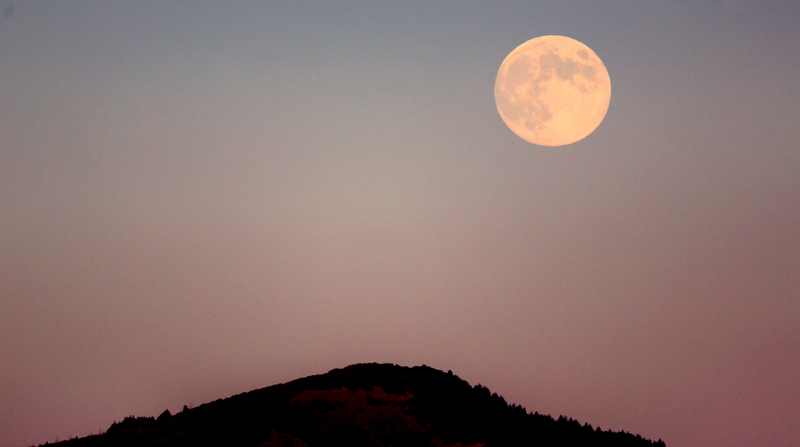 Many cultures call the full moon of September the Harvest Moon. Native Americans have other, equally evocative names: Nut Moon (Cherokee), Mulberry Moon (Choctaw), and Moon When the Calves Grow Hair (Dakotah Sioux). The Celts called it the Singing Moon and it was the Barley Moon in medieval England – the time to harvest and thresh ripened barley. Here in Sonoma County, the Harvest Moon rose on Sept. 18. Sept. 22 is the autumnal equinox, the first day of fall. Step outside and note the differences that come with harvest time. Chinese pistache trees, the west coast equivalent of New England’s autumnal color, turn red, orange and yellow. Sturdy-stalked sunflowers bow heavy heads as blooms wither and seeds ripen. The light changes, especially in the evening, becoming more golden, as the sky appears bluer. With cooler weather, the final flush of roses have deeper tones, what was creamy white in July is now pink. And yellow dandelions have turned to fluffy orbs, their seeds floating off in the wind. Risa Aratyr, 59, of Sonoma is a Wiccan who’s studied folklore. Wicca, she explained, is the name they give the Celtic Neopagan religion, paying homage to Earth, the Mother Goddess. To some, harvest time may be only a olfactory nuisance as the Sonoma Aroma descends, letting our noses know farmers are spreading manure on their fields. However, to the growers of the county – backyard vegetable gardeners to large-scale farmers and vintners — harvest time is a time of reflection, looking back at the summer’s crops and being grateful for what the land produces. Last week, their kitchen counter was covered with acorn and butternut squash. “This is where I feel like a squirrel storing up for winter,” Joanna said. Joanna, 49, and Don, 55, have been gardening since the early days of their marriage, starting with planting tomatoes in flower beds. Now fruit trees are espaliered along a fence that once supported roses. Winter produce – kale, lettuce, broccoli – was planted in late August. Why do they garden? For one thing, their crops provide a “tasty, healthy alternative” to store-bought-produce, Don said. Randy Pitts, owner of Harvest Moon Winery on Olivet Road in Santa Rosa, was born and raised on the 9-acre winery where his family’s grown grapes since 1976. In 2000, he came on board, and wears a number of hats, primarily those of grower, winemaker and marketer of Harvest Moon’s Gewurztraminer, Zinfandel and Pinot Noir wines. She and her husband, Joe Tresch, own the 2,100-acre Tresch Family Farm, home to Holstein milking cows. When the property next door was saved from being a wastewater pond or dam, they bought the land and began planting apple trees. Her harvest is a long one, beginning in mid-August with Strawberry Parfait, Sweet Bough and of course Gravenstein, and extending into November when Arkansas Black is among the final varieties to be picked. Growing apples, she said, “feels like doing something timeless, something my grandparents did. It’s unadulterated, unprocessed, people have been doing it for centuries. Lennie Larkin, 31, is the farm manager for Petaluma Bounty. The local nonprofit grows produce on its Shasta Avenue farm which it offers at affordable prices to low-income families and seniors. On a foggy September morning, Larkin led a team of volunteers harvesting greens: kale, chard, basil, loose leaf salad mix and heads of lettuce. “I have endless joy and pride in harvesting,” she said. “Yesterday I was harvesting Cherokee Purple tomatoes and thinking back to May when I was running around with a team, trying to get the plants in the ground before it got hot; and then remembering two months before leading volunteers who were potting up the tomatoes; and then the days in February, cold and overcast, in the greenhouse, sowing the same seeds.